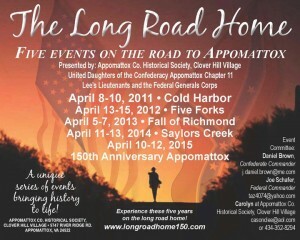 Clover Hill Village, Appomatox, VA over the next five years will be having a special series of events titled The Long Road Home which will follow Civil War soldiers on the final campaign leading up to a major reenactment of the 150th Appomatox. This series will be unlike any event presented so far in that it will be reenactors and living historians working together to make these events as real as possible for the public. And unlike any other event the spectators will find themselves stepping beyond the yellow tape barrier in an interactive experience with them able to do such things as volunteer to help soldiers write home, help medical personnel with difficult patients in a fully set up field hospital and talk directly to the commanding generals.